Help skin recover from sun damage. Natural anti-aging ingredients like polypodium leucotomos extract, or PLE, boosts skin’s ability to protect itself from harmful rays, while others like vitamin E, vitamin B3, and oatmeal hydrate and soothe. The all natural formula moisturizes and tightens skin to reduce the appearance of wrinkles, discoloration, and age spots. 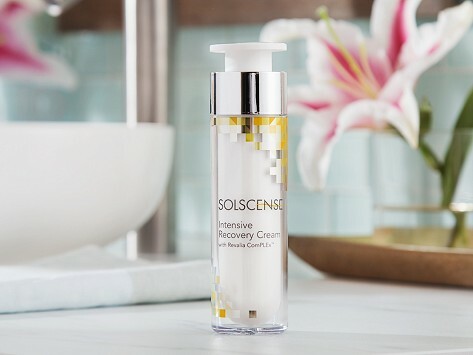 Solscense is a daily moisturizing cream packed with natural anti-aging ingredients that work together to help soften the signs of sun damage. It’s Made in the USA and comes from Dr. Jeffrey Whitten, a British bio-organic chemist who has worked with pharmaceuticals for over 30 years. Solscense focuses on protection and recovery from sun exposure because UV rays are the primary source of signs of aging. Dr. Whitten created a formula that relies on all its ingredients to work in harmony with the goal of minimizing things like fine lines, sun spots, and redness. At its foundation is polypodium leucotomos extract, or PLE. It works at the cellular level to repair sun damage while also boosting skin’s ability to protect itself. Vitamins including C, E, and B3, antioxidants, and shea butter join in to plump and moisturize your complexion and promote healthy skin cell growth. Rosemary extract and oatmeal—along with other natural ingredients—soothe inflammation and even out skin tone. Solscense isn’t a replacement for sunscreen but it can replace your daily moisturizer. You can also add it to your usual skincare routine to help put your best face forward.